Evergreens hung in the house in the middle of winter bring good luck and remind us that Spring will come again. We’ll provide a variety of seasonal greens and guide you through the steps to create your own rustic hand-tied seasonal sprigs to festive-up your place. Join lettering artist Whitney McRae Johnson who will show you how to create your own personalized hand-lettered gift tags to embellish gifts to your loved ones. Learn the art of hand-lettering and get ready for giving! Forget the Christmas email, and come make your own Christmas cards to send to far-away friends and relations! Strange Fellows’ brand artist Christine Moulson will lead this lino printmaking workshop. Grace Lee of Eikcam Ceramics has made some beautiful porcelain ornaments for you to decorate… either to enjoy as a family keepsake or to give as a unique handmade gift! Limited workshop seats available on a first-come, first-served basis. Advanced reservations** available by email to objecthandmadestudio@gmail.com, as well as in person at the Market. **If you have reserved a spot by email, please arrive 30 minutes prior to the workshop to sign in, pay for your workshop, and get yourself a beer. If you do not arrive within this timeframe your spot could be given to someone on the waitlist. 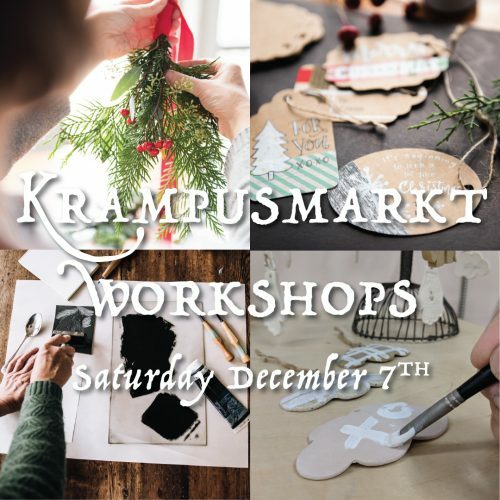 *Proceeds from the Krampusmarkt Workshops will be donated to the YWCA’s PEACE (Prevention, Education, Advocacy, Counseling & Empowerment)Programthat provides individual and peer support to children and youth who have witnessed abuse, as well as community advocacy on the effects of abuse.